What do you do when you have had a stressful day and need to relax? Maybe you enjoy listening to some music. Perhaps you make yourself a cup of hot tea. Or maybe you prefer to take a walk. 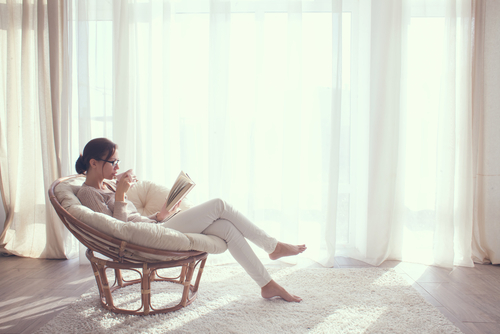 Did you know that research shows that a mere six minutes of pleasure reading will have a faster and more therapeutic effect on your body than any of these methods? According to a study by the University of Sussex, volunteers who underwent a battery of exercises and tests and then tried out traditional methods of relaxation, experienced 68% lower stress levels with pleasure reading. The study participants only needed to read silently for about six minutes to achieve a slower heart rate and more relaxed muscles. In contrast, listening to music reduced stress levels by 61%, sipping a hot drink by 54% and taking a walk by 42%. Playing video games brought certain stress levels down 21% but still left the study participants with heart rates higher than when they started playing the games, the study found. “Losing yourself in a book is the ultimate relaxation,” stated Dr. David Lewis, the cognitive neuropsychologist who led the study team. He explained that pleasure reading stimulates our imaginations and allows us to enter an altered state of consciousness. Pleasure reading may offer other important benefits. According to a University of Liverpool study, for instance, reading can help make us make us feel more empathy toward others. Additionally, 17% of the study participants reported that reading helped them to remain calm during disagreements with others. A University of Buffalo study on reading backs up this connection between reading and empathy. In that study, which was published in the Psychological Science, participants who read chapters from Harry Potter books self-identified as wizards, and participants who read chapters from the Twilight series self-identified as vampires. Researchers concluded that the sense of “belonging” to those fictional communities can provide the same satisfaction people get from belonging to real-life groups. “Books provide the opportunity for social connection and the blissful calm that comes from becoming a part of something larger than oneself for a precious, fleeting moment,” study author Dr. Shira Gabriel said in a post-study press release. The simple act of reading slows our bodies down while inspiring our creative juices to flow. If you are a high-energy person, reading forces you to take them time to be still for a period of time. Even if you read for only 20- to 30 minutes each day, this downtime can have far-reaching benefits. For example, researchers have found that reading improves memory and may even help reduce the chance of Alzheimer’s disease. In this fascinating Ted Talk, Lisa Bu shares how reading has enabled her to expand her mind and to create a new direction for her life. “Books have given me a magic portal to connect with people of the past and the present. I know I shall never feel lonely or powerless again,” says Bu in her talk. How can you tap into this convenient, low-cost method of stress reduction? The key to feeling more relaxed is in picking something you want to read. Reading the daily news, for example, may actually contribute to your stress if it’s not your cup of tea.. The book or article you want to read can be on any topic that interests you. It could be a gardening guide or a cookbook if those are your hobbies. Alternatively, you could select a romantic novel that is set in an exotic location. The choice is yours. Next, find a location where you will be comfortable and undisturbed. Distractions include people, of course, but also electronics. Be sure to silence your phone so that you will not be tempted to check an email or social media post and thereby lose your sense of reverie. You’ve always known that reading was good for you. Now you know that reading not only expands your knowledge, but it can have other far-reaching benefits. There is no better time to visit your local library or to download a book for your e-reader. Happy reading! This entry was posted in Informational, News and tagged Health, mind, Reading. Bookmark the permalink.